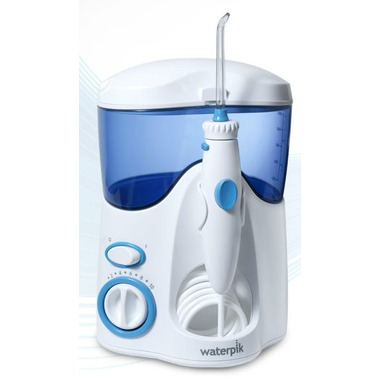 With state-of-the-art technology, the Waterpik Ultra is the ultimate in water flossing performance. It features ten pressure settings, a contemporary design that is smaller and quieter than previous models, a covered reservoir with in-lid tip storage and six unique tips. This model is the most recommended by dental professionals. A fair product, but would be better if the rubber rings on the flow interrupter piece didn't swell after a week or two and cause the button to stick... If the rubber were replaced with non porous silicone, then it's be the perfect product. I've been using a WaterPik flosser for years. Highly recommend to help gums stay healthy, remove food particles and they are great for those with braces. Great service and fast shipping. The product is one I had bought before and decided to buy another unit for the house. I would give it a 5 but the 2 I have owned all failed the same way .... after a while the water coil breaks open and it is finished. The waterpik has been a life saver since I got my braces. It helps deep clean around my gum line and in the small crevices on my brackets. It does take some getting used to having so much water sprayed in your mouth at once so just stick with it and you will get the hang of using it! My only complaint is that sometimes I do wish the water reservoir was a bit bitter. Bought this for my daughter, she just got her braces and it's great for cleaning food particles in between her braces. She loves it! This product works well for about a year. After a year a hole in the hose develops right below the flossing unit. I have owned 3 of these and the same problem with each. I like the unit , but wish it would last longer. This is my first waterpik. It was recommended by my dentist. Less noisy than expected. So far I love it!! Very fast shipping from Well.Ca. This is the 2nd waterpik we've had. The first one died of old age. It's great for oral hygiene.. Teeth are whiter, breathe stays fresh longer. and good checkups at the dentist! It is a bit noisy compared to the last one. love this waterpik, works great perhaps a bit noisy but not to bad. Excellent product. Easy to use and maintain. This is the first Waterpik I've used. I am still getting used to it. My teeth feel so much cleaner after I use it. This one is compact and easy to use. My only complaint is that it is noisy. I like using this but it gets a little messy when you are done so you need to make sure you have towels underneath the unit to drain it entirely. This is the second (identical) machine I have bought from this supplier. The price is very competitive, order execution and delivery time reasonable. The first was for me, to protect my investment in very expensive bridge work. Yes, it takes some time to become accustomed, but more than well worth it. (It should be considered as a necessary supplement to flossing and regular brushing.) My 2 grandchildren have braces, tried my machine, to the point that they were convinced that they would be able to use it to their benefit, so my second purchase was for them. I have been using this WaterPik for several weeks now. I am fighting gum disease tooth and nail and this is a worthwhile weapon. After I've used it I know my teeth and gums are clean! I need a WaterPik for my gums. This one is doing a great job. My teeth shine and after two weeks of use I've noticed my gums are so much better. Received it quickly at a great price. It was purchased for my son who has braces and it works very well. I tried it myself and found that it works very well. I produce a lot of plaque daily and my mouth is definitely cleaner using this device and brushing, compared to flossing and brushing. After brushing my mouth feels "just from a dental cleaning" clean. Love this product - had a large one for years, then tried the portable one, but the battery always died and it only lasted 9 months. So plugging in works and my teethe always feel amazing after I've used it. This is the best price I found for the waterpik, both online and in-store! Comes with more tips/attachments than you will need. Not too noisy, easy to use (took one or two tries not to soak my face and countertop), and the results are worth it. Like many I was looking for an alternative to flossing. I currently have braces and so normal flossing is a big pain. The WaterPik is amazing for allowing you to clean the brackets and getting food particles in between the teeth. The only negative I would say is that the machine is pretty loud, at least much louder than I anticipated it to be. This is the best price I have found on the waterpik. This little machine is amazing! It cleans your teeth like a toothbrush cant. Your mouth feels like it has had a professional cleaning every time. This is an Amazing product, wish I would have known about it Years ago!!! I have gum disease and typically go to the dentist 3 times a year to get my teeth cleaned, mostly because the plaque settles below the gum line. Within 2 weeks (I hadn't been to the dentist in a while), my gums were no longer bleeding (from inflammation) and I would say from the first time I used it, my breath was smelling better. I like using it with some mouthwash in the tank for an extra-cleaning effect. Just remember: If you didn't floss before and aren't inspired to be rigorous in using this machine regularly, you're no better off. ;-) I Hated flossing because I knew, with gum disease, the floss didn't go beyond my gum line where it was really needed. I Love this machine and use it morning and night. Amazing results, just make it part of your daily hygiene routine. Very easy to use and truly does show results after a week of use. Love it. Wish I'd bought one sooner. Best price I could find in Canada. I have gum disease so when I floss, there is still a large area under the gums that dental floss just can't reach. By the time I ordered this product, my gums were bleeding when I brushed my teeth. Within a week, the bleeding had stopped and I'm now ready to call my dentist, who usually scolds me. It's easy to use when you figure out how to use the machine without having water all over the place! I like using it with a capful of mouthwash. Definitely better breath and it's gotten me to use it and brush, twice daily. I love it and highly recommend it! Good product. Handy to have the different attachments stored inside the lid but unfortunately no room for all of them. Haven't used all the attachments yet but after a few weeks of use I continue to be satisfied. Would highly recommend. Pretty good. Nice and strong. When I first used it, I cranked it right up and my gums have never bled that bad before. I had also just had a scaling/cleaning from the dentist though so i likely had wounds. My gums can handle it now though and it leaves me feeling very refreshed after using it. Wish it came with the tongue attachment though. Great Product. Worth every penny. Really cleans well and eases gum soreness caused by unreachable food particles. Really good for kids with braces too. I love this! I had been thinking of getting one for years, but when my dentist did a really bad filling job making it almost impossible to floss and no easy fix but to re-fill...I decided to finally make the investment. What a great decision! I feel it does a better job than floss ever has. After I use it I have tried flossing with regular floss, and there is not a trace of plaque. I also love it's compact design and how easy it is to use. ONE OF THE BEST INVESTMENTS I EVER MADE!!! I've known about the "Waterpik" since the 1970's, but never bought one because I didn't think it could make much of a difference. Lately, however, I've been noticing that some of my gums were starting to recede, so I thought I'd give it a try, especially since I ran across a Youtube video from a dentist's office where one of the dental hygienists was demonstrating how to use one. She said to fill the tank with warm water and start on a low setting until you get used to the sensation of the pulsing. I've used it three times today. It feels fantastic on my gums, in between the teeth, inside the pockets, under the gumline... And they look AMAZING - healthy and pink. I wish I would have started using a Waterpik when I was a teenager. If you have any gum issues at all, or want to prevent having any, GET THIS MACHINE!!! Excellent product for those with gum disease starting. Powerful water flow to flush the bacteria out of your pockets. Excellent value for the price. I love this product. I have had one for a few years now and recently bought for each of my adult children. It is amazing what a difference you feel and see, even after brushing. All the small food particles that you missed get cleaned out with this product. Love this waterpik. The variable pressures, multiple attachments and large water resevoir ensure a clean flossing everytime. Highly recommend it. Awesome product. Your teeth and gums will appreciate your care and attention. I bought this product because I recently got braces, and I'm loving it so far. I wish the instructions had suggested wearing something water resistant like a raincoat or something prior to first use because I soaked myself and most of my bathroom. Now that I've gotten the hang of it, I can't believe I've waited this long to get a Waterpik. My mouth has never felt so clean. Even after brushing, flossing and rinsing, the Waterpik still finds debris left behind. I have bought this product about 2 weeks ago and I already feel an improvement in my gums. I have had sensitive gums for a while now and flossing just made it worst which is why I got this product. My gums are so much better and my teeth feel cleaner as well as my breath now that I use WaterPik twice a day. I highly recommend it. Great product! I use this after flossing and brushing my teeth every night and I feel so clean after. There are still some food particles that comes out even after flossing & brushing. I am little disappointed though that the tongue cleaner didn't come with the set. The motor of my 3-month old Waterpik Water Flosser Model WP-100/110 suddenly died! What kind of a product is this? What am I now supposed to do; buy a new one! If that's the case folks, think twice before you purchase this product. Scam or what? I'm very happy with this product. My teeth are very close together which makes traditional flossing hard. With this, it's easy! I've only used the flossing tip so far, but I'm really happy with it. This is a great addition to my oral care routine. I've only used it for a couple weeks, so there's still a bit of fine tuning. As suggested I started at a low setting and increased it a bit at a time. I can't imagine ever using the highest setting, but perhaps that's just me. Well.ca had it ready for shipping ,sent and delivered to rural NS in four days.That being said, I would highly recommend it. Great product with a good history. I highly recommend it. This is my first waterpik, wow, what a shock! Couldn't believe the stuff that came out of my mouth. There is a learning curve to this machine, besides getting water all over the place, I used a too high of a setting and cut my gum with a blast of water, so, start out slowly. Now that I got it down pat, I'm real with my clean teeth. Well.ca is the best! Have used various WaterPik products over the years. Actually, going back decades ago. This one shines in looking much better, occupying less space and having more practical functionality â€“ for example, the reservoir cover system. Agree with other purchasersâ€™ comments regarding accessories, in particular the debateable usefulness of the tongue cleaner. Had thought my floss challenges were answered with Sonicare AirFloss â€“ but not according to latest visit with dental hygienist. Think WaterPik model recently purchased seems good in every respect and hope/look forward to positive next dentist experience.